STEM – Science, technology, engineering and math. STEM is often referred to by educators as the new Three R’s. These four separate subject areas are combined and infused into almost every aspect of our lives. To create a STEM class or a STEM project, these individual subject areas are integrated into one learning experience. At its heart, STEM is about solving real-world problems through science, technology engineering and math. Rather than teach the four disciplines as separate disciplines, STEM integrates them into a cohesive learning paradigm based on real world applications, encouraging rigorous problem solving and critical thinking skills. According to the Alliance for Science & Technology Research, there will 81,000 high paying, STEM related job openings by 2020. These openings will need students with a strong STEM background to fill them. The demand for scientists and engineers is expected to increase at four times the rate compared to all other occupations over the next decade. When it comes to salaries, the average annual STEM salary is $50,000 more than all other average annual salaries. In MPS, students can elect to participate in the STEM program any time during their K-12 schooling. Mustang Public Schools (MPS), STEM represents teaching science and mathematical concepts through the integration of technology and engineering design. Mustang has received several STEM grants, and bond funds for STEM development has been approved by voters spring 2014. These funds have allowed many teachers to go to STEM training and have purchased technology and science equipment to better equips our STEM classes. In the elementary schools, STEM learning takes place in the form of exploration. Some elementary schools have a STEM room where students go for a STEM lesson. Other elementary schools have STEM centers included in their center rotations. At the intermediate level, every 5th & 6th grade student rotates through a 9 weeks STEM course. Topics in the course include motion and forces or aerodynamics and aerospace. In the middle schools STEM classes such as the Gateway to Technology are offered as elective classes for students. High school students are provided many STEM opportunities through courses, such as the computer programming, Robotics, or science and math advanced placement classes, medical terminology or Forensics. We have recently added STEM Blocks to our high school course list. A STEM Block replaces a traditional math course and/or science course. It is for an extended amount of time, but allows the student to receive both a math & a science credit towards graduation for the one class. 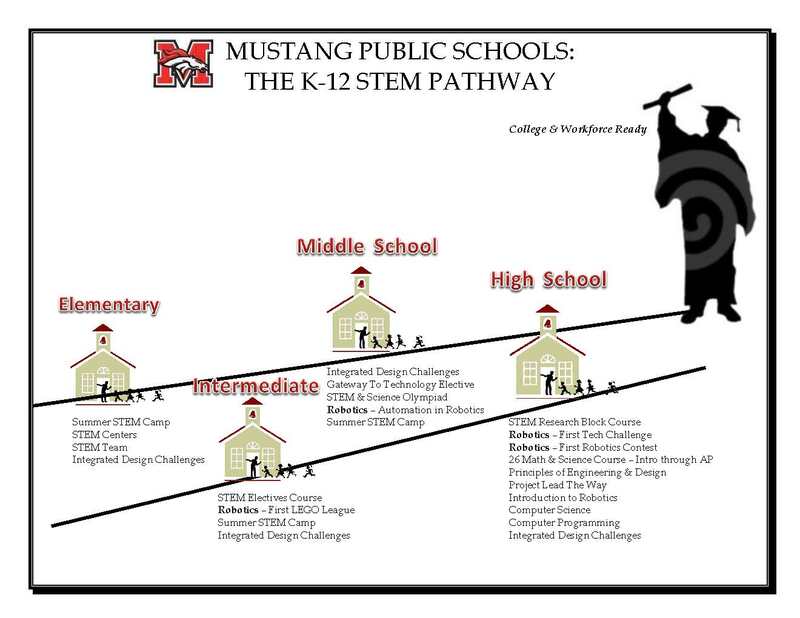 The ideas and plans for STEM in Mustang are designed to prepare students for our every changing society. MPS has become a certified STEM Community. A STEM community involves more than just the school. Community organizations and local business and industries are a part of the application process and partnership as well. MPS partners with Canadian Valley Technology Center to offer a STEM Summer Camp. Last year 184 students attended various courses such as Electric Art, Computer Programming, Movie and Video Making, Streaming Into Space, Forensic Science, Basic and Advanced Robotics. 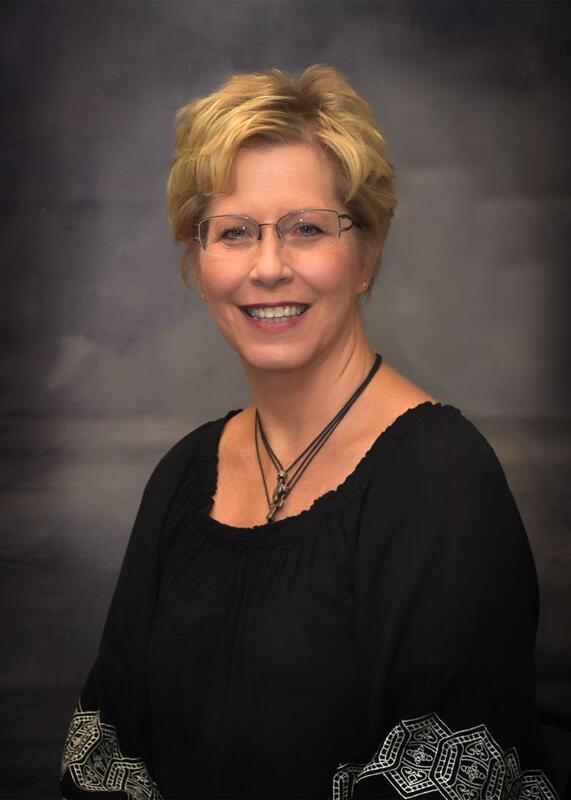 Angie Choate is the STEM facilitator and summer camp coordinator. She is working to more closely align the elementary STEM programs and provide extra after school STEM opportunities for our students.